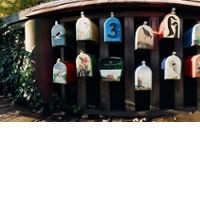 As postal rates go up, the task of invoicing your customers can get expensive quick. One way to save money is to print your invoices on postcards. 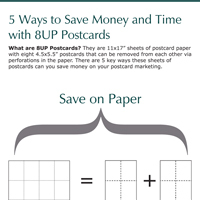 You not only save money on postage (when using a 5.5″ x 4.25″ postcard), but you also save time and money by not having to fold and stuff your invoices into envelopes. 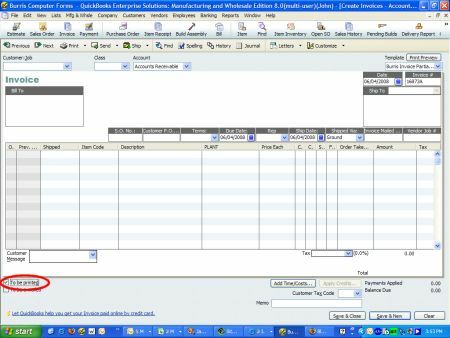 For QuickBooks users, it is a relatively simple matter to create an invoice template that can be printed on blank postcards. 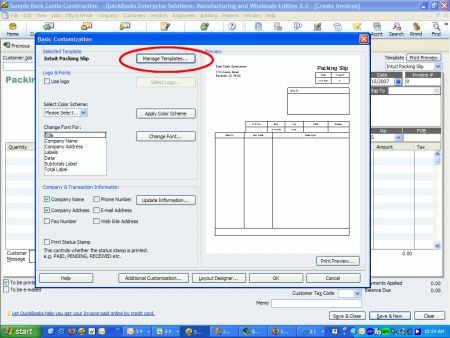 Open a new invoice, and click on the customize button in the upper right hand corner (see below). an alternate way to get to where we need to be is to go to the lists menu and click on templates. When the list of templates comes up, click on the one that you wish to work with (it will be highlighted black after you click it), then click on the templates button at the bottom left hand corner, and choose “edit template” (see below). Click the “manage templates” button. 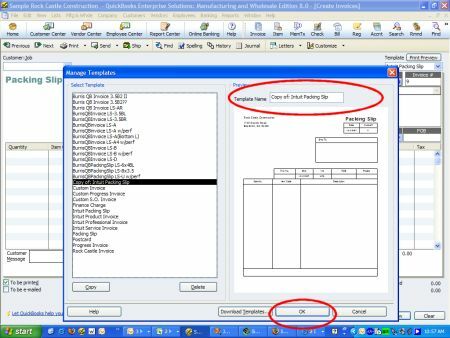 When the manage templates screen appears, click on the template name you are working with and click the “copy” button in the lower left hand corner. You will now be working with the copy you just made. Rename your template using the field in the upper right hand corner, and click OK.
Click on the “additional customization” button. This will bring up the screen where you can add columns, etc. Once here, click on the “print” tab. 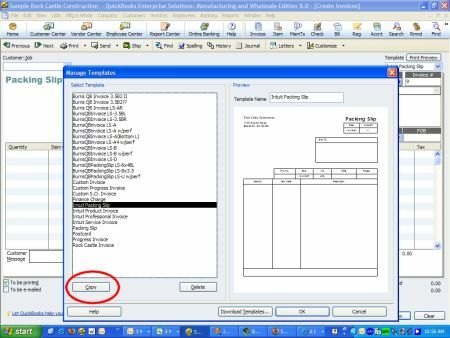 You will make two changes here: choose the “Use specified printer settings below for this invoice”, then change the orientation to “landscape”. Keep the paper size 8.5″ x 11″. Once you’re done, click “layout designer”. A. Leave room in the upper right corner for the stamp. 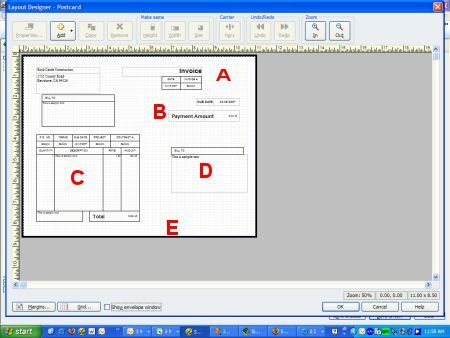 C. Shrink your main portion of the invoice to the left hand side of the postcard. D. Place a copy of the bill to address in the lower right hand corner of the postcard. This is so the postal scanners will be able to properly scan your customer’s address and get it delivered there. 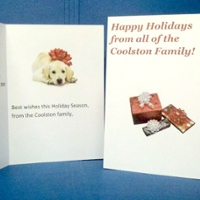 E. Leave a 5/8″ margin at the bottom of each postcard. Sometimes the Post Office places a sticker with a bar code at the bottom. If you leave that margin available, then you won’t lose any information. 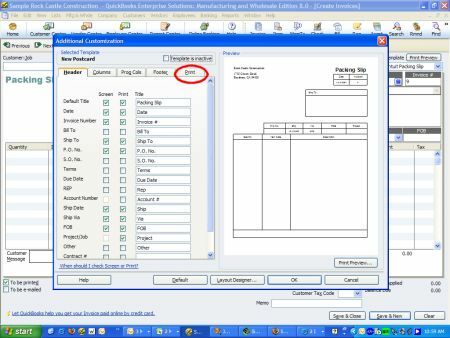 Printing your invoices using this method you won’t be printing your invoices out one at a time, you will instead be batch printing them. 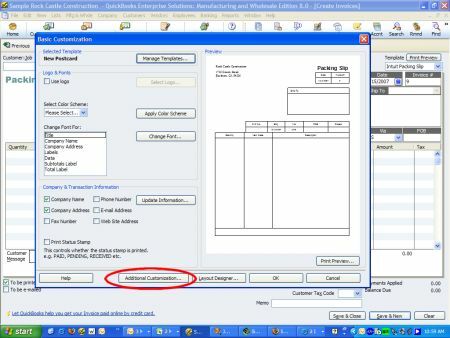 When putting your invoices in, make sure that the “to be printed” checkbox is checked on each invoice. *** These next instructions will not have any screen shots with them as they are general instructions for printers and every printer will be different. 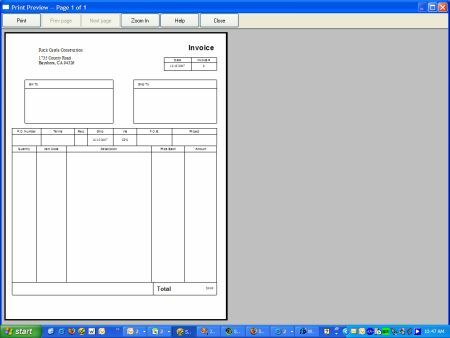 When it comes time to print your invoices, go into the properties of your printer and find the option that lets you determine how many pages fit on a sheet of paper. Change this option to “4”. Once that is done, print out your invoices! why not print to pdf and email them instead? Good question. Some of our customers are fine with receiving emails from us. However, some, if not most of our customers still prefer the getting the invoice the old fashioned way. If we were to use our experience as an example, small businesses should offer both methods of receiving to their customers. 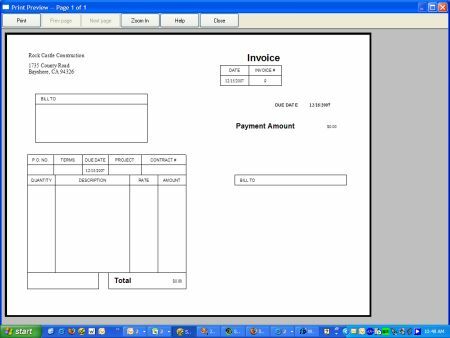 For those customers that need to have their invoices mailed to them in paper form, this method is simply there to help save on postage, supplies and the time (re: payroll expense) in preparing an 8 1/2″ X 11″ invoice stuffed in an envelope. Do have have directions on how to print customer statements on 4/pg postcards? If a customer has outstanding invoices they will not show on a current invoice, nor will any assessed finance charges. The basic directions should work the same. 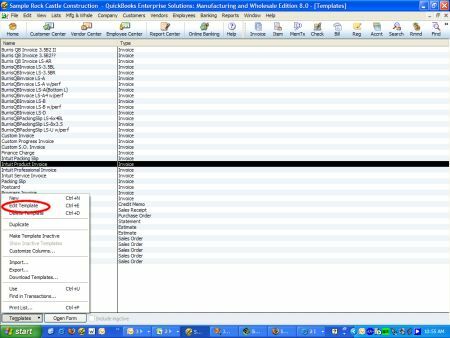 You’ll need to customize the statement template in the same manner. Steps 1-4 of the above don’t apply. Simply get to the point where you can lay out your statement and follow step 5. How do I get post card bills to print on a tractor feed that has 4X6 billing post cards? Create a new template with 6 x 4 measurements. 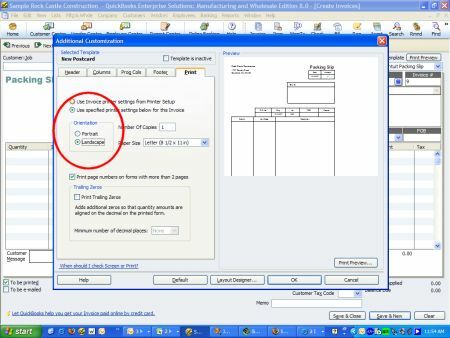 Then, check the “to be printed” checkbox, for each invoice you want to print. 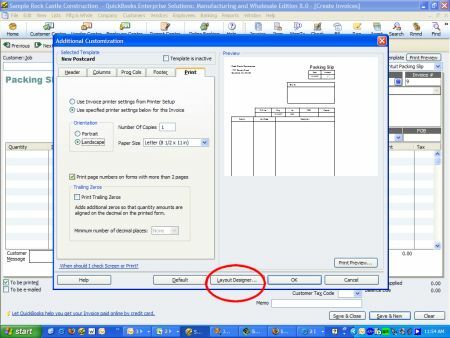 Print using your printer’s normal settings of 1 page per sheet. We hope this helps. I’m doing my statements on your four of a kind postcards. Everything prints out on postcard except the customer and the billing address. Can you tell me why that is not printing on the postcard? 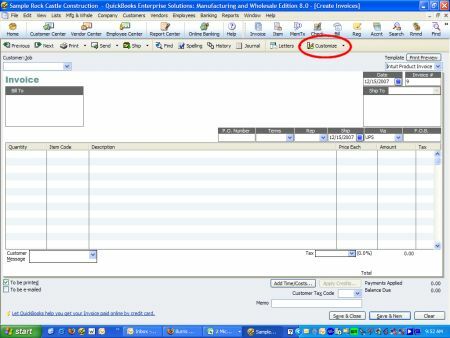 Do you have the customer and billing address fields on the statement template? If you do, please respond with more information about how the postcards are printing out.